I think most people end up having a complicated relationship with weddings — I certainly do. 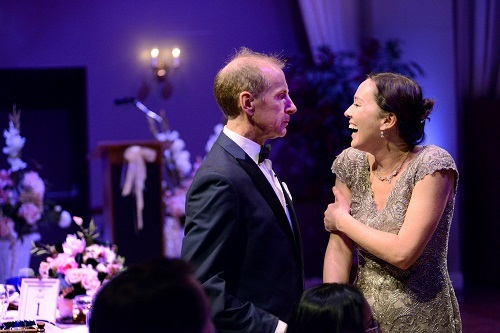 The Wedding Party by Kristen Thomson, produced by Crow’s Theatre, is a glorious fiasco of complicated relationships that play out on the wedding day of a young couple. The couple themselves are pointedly absent as characters. I have very often seen unhealthy family dynamics usurp the attention from a couple on their wedding day, and this show is about that. Central to the conflict are the father of the groom and the mother of the bride. The father of the groom, Jack, is the villain of the piece. He’s an arrogant, wealthy businessman, and having a young wife doesn’t stop him from hitting on his son’s best friend. The mother of the bride, Madeline, is a bit too loud, a bit too fond of alcohol, but her downward spiral into bad behaviour doesn’t start until she overhears Jack bad-mouthing her daughter. Much of the humour is built on each actor playing multiple characters. It’s delightful to see them switch personas on a dime, and the costuming details and staging to affect these quick switches are ingenious, but the real payoff comes when metatheatrical jokes appear. The dialogue is whip-fast and whip-smart, and the physical comedy is ridiculously impressive. From an attempt to pull a drunken Madeline off a table turning into a Christmas-lights tangle of people, to an actor playing two guys getting into a fight with himself, everyone did wonderful work with their bodies. I was afraid for a moment that there was going to be some transphobic “man in a dress” gags, but as the show went on, my companion and I were relieved that the men playing women characters were doing so seriously. And by “seriously” I don’t mean that it wasn’t comedic, I mean that the characters were well-developed and performed with attention and intention. With the number of characters per actor, each person had to play at least one character of another gender — or another species. There is also dog. I loved the dog, but it was a bit jarring when he suddenly began to speak, after being played as a regular non-verbal dog up until that point. Another moment that tore me out of the play was when Jack experienced a medical issue and had a fantasy, played out onstage, of being sawed in half. The latter, and possibly the former, tied into a circus theme that is also used as a framing device at the beginning and end of the show. Unfortunately, it seemed a little contrived to my friend and I. The Wedding Party is full of madcap antics and zany characters, but doesn’t have much in terms of plot or message. I felt like the circus thing was trying to create more meaning, but it didn’t land for me. I’m fine with a fun night of laughter without any larger point. I’m also fine with the weird surrealism of the talking dog and the sawing in half, and almost wish the play had gone further in the direction of dreamscape than trying to insert gravitas. Overall, though, I entirely enjoyed myself, and laughed myself out of breath at more than one point.